Baby Boy or Baby Girl, even if we have a surprise genre, the project comes to be unisex, there's no problem. Our Team have many ideas and each one have a particular decoration. The first topic to start the process is select a warm color, because mood is defined by the environment color. Rose and blue are old colors for this age. Yellow and red are intense colors to give your baby a full rest, in change, turn the decision to peaceful colors, as blue, white or green. Black is not a happy option unless you combine the vision adding a bright color. To make a right decision explain the idea to our agents and They will know how apply and make a better environment in the room. Here in BKNY Painting are prepared to advice a customer. Our worry is always you finally end satisfied with the service. There are happy, Sad, and neutral choices. We recommend pastel colors. Experts in decoration indicate that calm colours as grey are perfect in sensation for babies. 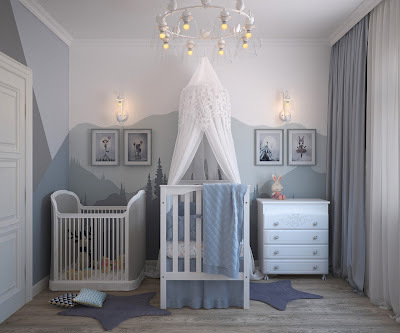 New York babies need to feel their rooms are designed especially for them and the best emotional peace to grow up. Combination is an art of decorative process. Let that part in the professional team as BKNY Painting who can tell you join colours with the comun white. Pale rose, beige, blue or brown. Grey with rose is an awesome paint. If you want to take a risk We can offer Grey/White/Yellow. An elegant and perfectly babyish in New York. We heard other expert opinions about colours. The important things are luminosity and The room proportion. Small rooms prefer light colours but warm one, for example orange, beige or light yellow, in change blue, purple or green make smaller place. Roof paint is a crucial element, more light than walls make a bigger room. Last note: Wallpaper is better, if you want a funny and full joy decoration It is an excellent choice. Vinyls are a beautiful option and chalkboard paint is a creative way to bring your expectations real.